This certification program contains 17 video courses. These videos contain the same information covered in our LIVE, online, 1-hour, instructor-led classes. You will also be able to download the training guide along with any class files that are used in the video course. Once you've completed all the lessons in all three series, you'll have a final test that also requires a passing score of 80% or higher. You will also need to submit a final project that tests your knowledge of the various topics covered in the PowerPoint Certification program. 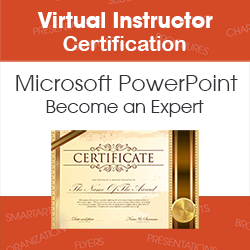 You'll need a passing score of 80% or higher on the project as well in order to receive your Virtual Instructor PowerPoint Certification. This class describes how to add transitions to slides within your presentation. You'll also learn how to control the display options for individual slides by adding custom timings to individual slides. This course shows you how to add video and audio to your presentation. We'll also demonstrate how to use the commands found on Video Tools and Audio Tools Tabs to add and edit video and audio. This hour you'll learn how to embed YouTube videos into your presentation. You'll learn how to easily link to a YouTube video. We'll discuss the issues of pixilation when linking or embedding a video. This lesson also describes how to add an organizational chart to your presentation. You'll also learn how to use Microsoft's Broadcast Slide Show to display your presentation on the Internet.